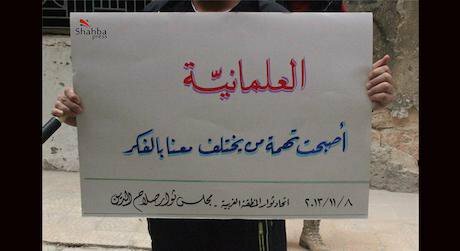 A banner from the Salahuddin Revolutionaries’ Council in Aleppo’s Salahuddin neighborhood. It reads ‘Secularism became the accusation against those who disagree with our ideas’ – 8-11-2013 (Shahba Press Agency’s official Facebook page/Fair use. All rights reserved to the author)]. [This series of opinion articles on the relationship between secularism and authoritarianism is the outcome of a collaboration between SyriaUntold, openDemocracy’s NAWA and the Samir Kassir Foundation]. Despite political conflict between the two – sometimes even bloody – the existence of one is inevitably linked to the other. In fact, the current state of Arab ruin, especially that in the Levant, is an extension of that dynamic. It can’t be denied that the fall of the nationalist ideology meant that Arabs reverted to the Islamist one. In fact, Islamists themselves have said so. This Islamist false claim says that with the fall of Ben Ali’s regime, his adopted ideology of Jacobin laicism – which was the basis of his dictatorship – fell, with the understanding that it was based on modernity. Soon after, the regimes of other Arab states followed suit, apparently proving this claim right. In fact, it gave credibility to the “Islamist alternative” with the rise of political Islam in Tunisia and Egypt, as well as the growth of Islamist movements in Syria that took over the struggle against the tyranny of the Asad regime. All these were taken as indicators that Arab secular ideology has fallen after having been the cornerstone of dictatorships. Undoubtedly, both axes are a product of a larger foundational cultural context, especially in terms of trying to delegitimize secularism by undermining its modern content and turning it into “just another ideology,” and regressing back to Islamic heritage as the cultural and historical path that establishes present and future Arab aspirations. This heritage is recreated a thousand times to serve the tyrant and the Islamists. Gamal Abdel Nasser was a good example (so are his ‘successors’) with his firm nationalistic legacy and the cartoonish aspect of its modernity and secularism. To many, Abdel Nasser was a charismatic legend who bought into a socialist ideology that was hostile to Imperialism and Zionism. But the Egyptian leader was in fact born into a religious sphere and was later influenced by the Muslim Brotherhood. The fact that he remained chained to this socialist ideology until his death did not sway him from the religious intellectual frameworks within which he was raised. Even when the Nasserist movement afterwards tried to establish a coherent narrative, it was unable to escape — on many occasions — from the use of Islamic symbols to legitimize its ideology. Libya’s Muammar al-Gaddhafi, the major proponent of dictatorship, was bolder than most Arab rulers when it came to presenting new “Islamic examples” that even the Ummayads didn’t dare to come up with. The goal of these wasn’t to twist the sacred religious heritage, but to give legitimacy to his dictatorship. Other Arab dictators exceeded Abdel Nasser in his ‘supply’ of religiously connotated ‘services.’ For example, Hafez al-Assad worked on the “sunnification” of Syrian society to exonerate himself in front of Syrians and to cover up for the crimes of his ruling elite after the Hama massacre (1980). These efforts included throwing religious celebrations that aren’t necessarily called for in Islamic heritage, setting up al-Asad Qur’an recitation centers, building mosques, and re-cultivating a group of pro-regime religious leaders who could step in instead of the Muslim Brotherhood. This mental mechanism of tying secularism to Arab dictators is like trying to tie Islam to French Christians under the pretext of “the Arab Renaissance [Al-Nahda].” For example, the claims by some that Arab dictators are seculars or that they have adopted a version of secularism (such as French laicism as is the case of Ben Ali’s regime in Tunisia) is not far from what Egyptian jurist Muhammad Abduh said in his famous quote that he “went to the west and saw Islam [i.e., independent thinking], but no Muslims; I got back to the east and saw Muslims, but not Islam.” In either case, we are facing totalitarianism: In the same vein to France’s origins becoming Islamic, secularism now equates dictatorship. The aim of tying secularism to Arab dictators is simply to bring it down. Consequently, to rid oneself of tyranny, it becomes important to fight secularist culture that brought about dictatorship. Following this logic, France is no longer the old city of “light” and renaissance whose people were originally non-Christian — France’s origins will become “Islamic,” but its people are unfortunately non-Muslims. Such Arab intellectual exercises are akin to current Islamist intellectual endeavors, which are more systematic in order to make the best of today’s deadlock in the Arab world. Sadly, secularism in the Arab world hasn’t had its fair share of study or criticism to be seen as a necessary and modern issue as opposed to a political decision that is forced by a dictator or passed via a number of legislations. It’s frankly absurd to argue that the fall of a few Arab regimes and the taking over of Islamists and fundamentalists is akin to the fall of Jacobin laicism in its Kemalist version. Such a reasoning wouldn’t exist if it weren’t for what was brought about previously by nationalistic ideology and its contribution to the longstanding Arab ruin. Lastly, we can’t forget that the current Islamist ideologies are the product of this ruin and they will only bring about more decay.